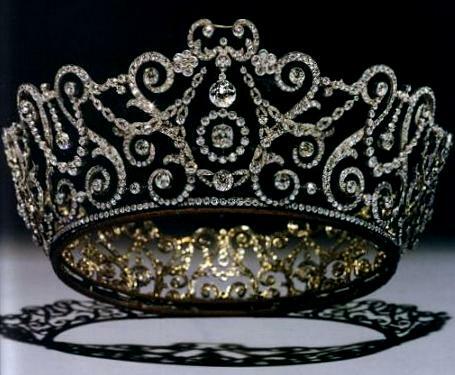 Made for Queen Mary to use at the Delhi Durbar and crafted from other dismantled jewels in her collection, primarily her Boucheron Loop Tiara, the Delhi Durbar Tiara is perhaps the largest tiara in the Windsor collection in terms of overall size. Originally topped by the Cambridge emeralds, it's been altered several times in the course of its life, but has only been worn a couple times since Queen Mary's days. Mary loaned it to her daughter-in-law Queen Elizabeth for a tour of South Africa in 1947 and it remained with The Queen Mother until she passed away in 2002. The Duchess of Cornwall gave the tiara its first appearance since 1947 when The Queen loaned it to her to wear for a banquet for the visiting Norwegian royal family in 2005. That was Camilla's first tiara appearance following her wedding. It hasn't been worn again since that single outing.